Since jumping into the whole sports card blog thing, I have been amazed by the level of collecting that made me realized I am nowhere NEAR the insanity some of you have. Must blog about Topps Chrome! From Pat's Tiger Collection, Corey's Wallach Obsession, Chris' Larkin grab, Night Owl's Nomo dojo, and a hundred others I could name, I realized I was more in the minority in how I collected. Now, I have added a few player collections, but I only have one player over 100 cards. Also, I am not trying to collect them all like some people. I think most would agree, though, that TJ, the Junior Junkie, is straight up crazy. Take Corey's "gimme all your Wallachs", and then multiple that exponentially because of the sheer quantity of his cardboard, and TJ is heads above them all. He's actually been purging some Griffey cards from his collection, if you have read his blog lately. I have been contributing to his collection via dime boxes, and only recently realized he collects more than Ken Jr. We now just mail cards back and forth - no trading. His last envelope was a nice treat. Let's start with the current items. Great additions to Sox teams sets. In fact, I am getting enough current stuff I can brave some of these cards into TTM requests. Sale looks like a 12 year old wearing his big brother's clothes, which I could care less as long as he stays on the south side and pitches as he does. I think he'll get a lot of Cy Young votes this year, but not sure if he'll win it over King Felix. Love me them bunting cards. Shame on Remy for wearing two in ones, though. This was an interesting card. I am still not sure if I like it or dislike it. Great photo, and I am willing to bet it was colored sepia. Why? I guess for the look of the set, but they should have kept it in it's original look. 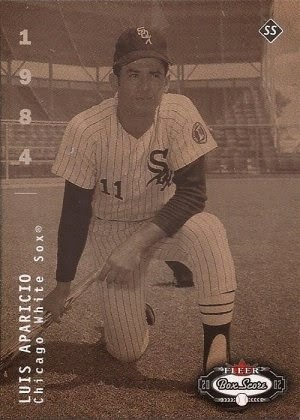 Still, I'll add it to the Aparicio binder. Sooooooooooo 90's. 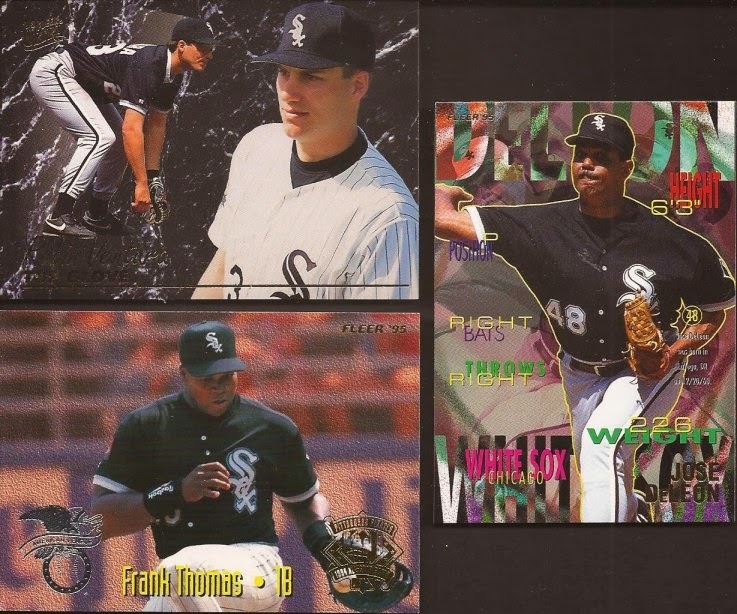 And I know Nick talked the other day about his love of '95 Fleer, but man those are some weird rectangles. Sometimes, things get created that are just too hard to comprehend, but impossible to turn away from. You just look at them longer and longer, and nothing makes any sense, but you cannot take your eyes off. This comment definitely made me smile. I really like that Sale with the 73T design. Although I'm not necessarily starting a player PC around him... I have started collecting a few of his autographs and a relic card for my left handed pitcher project. PS That video is straight up weird. If I have nightmares tonight, I'm going to blame you.